In the early 1800's iron was a necessity to farming as well as the home. Plows, axes, wagon rims as well as cooking utensils were all needed and in the eastern states these products were readily available and fairly inexpensive. West of the Mississippi, though, iron products were hard to obtain and expensive due to the high shipping costs from the east. There were no railroads at this time so iron was shipped either by wagon or by water. Some was floated down the Ohio River to the Mississippi and taken up to St. Louis where it was distributed. Other iron products that were heavier were put on ships that sailed from the Eastern foundries to New Orleans and then paddled up the Mississippi to St. Louis. What was needed to help the new country develop was an iron works in the frontier area, but the problems and the risks that were involved discouraged many iron industry owners. As early as 1825 Thomas James and Samuel Massey, who were running an iron works in Ohio, decided to take the risk in Missouri. They learned of an iron deposit from Indians who camped on James' land while on their way to Washington, D. C. James noticed their peace paint was made from hematite which was high in iron content. When he inquired, they told him of a large pit that was all red rock. While they talked about this place, the Indians also told him about the large spring and the wooded country. They arranged that when the Indians returned they would guide James and Massey there. When they saw the iron deposit, and the spring in Missouri near the present day St. James they decided it was definitely going to be the location of an iron works. 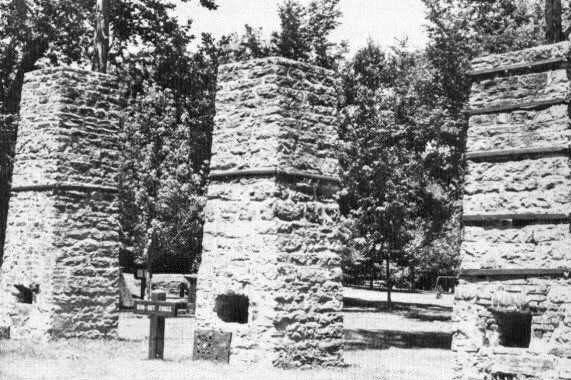 Others had built furnaces for smelting iron west of the Mississippi in Missouri. 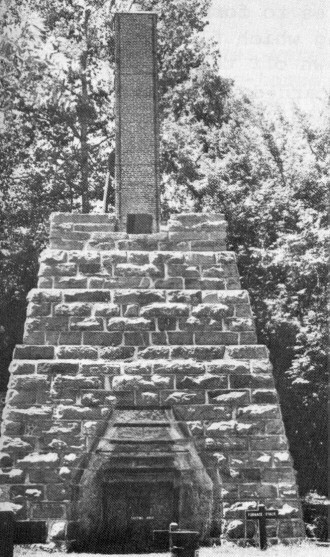 There was the Ashebran furnace near Ironton, erected in 1815, but closed in 1819 because of the depression. The Harrison-Reevees furnace near Bourbon constructed in 1819 operated intermittently through 1840. Both of these attempts failed because they could only compete locally and not in the east where the demand was higher. James and Massey starting the Maramec Iron Works in 1825 was the real beginning of iron production in Missouri. They had an ideal location. The mine produced high grade ore that was ideal for charcoal reduction with 63% metallic iron and low percentages of sulphur and phosphorus. The spring supplied enough water to power the mill and the abundant timber growth supplied the charcoal needed to fire the furnace. In 1826 the real work began with the clearing of trees and brush from the furnace site and the building of workers' cabins. In the spring of 1827 the building of the furnace was started with slaves hired from their owners carving the foundation from sandstone in a nearby mine and hauling it to the furnace site. Though there are no records or photographs of the furnace built in 1827, it was probably about the same as the one built in 1857 only smaller. The blast furnace took the greater amount of the time in the construction of the works. The outer wall was constructed of large sandstone blocks that were carved and laid one on top of the other to form the wall. Mortar could not be used because the expansion of the moisture inside would have caused the furnace to explode. Iron binders were placed through the channels left in the walls and tightened by wedges to secure the walls. The lining or inwall was laid about six to eight inches from the rough outer wall and the space in between was filled with loose stone chips to allow for heat expansion when the furnace went into blast. The inwall consisted of very fine white sandstone blocks so it would absorb the intense heat of the melting iron without cracking. The hearth at the bottom of the furnace served as the cubicle for molten iron and the slag. This had to be carefully built from the best stones because a crack in the hearth stones would allow in moisture which would cause an explosion or would let molten iron run through the cracks. Even the best hearth stones could not withstand the constant wear of the workers' tools for more than twelve to eighteen months. When these needed to be replaced the furnace was shut down during repairs. The ore was melted down into pig iron in the furnace. The mine, very high in iron content, was excellent for this kind of process. 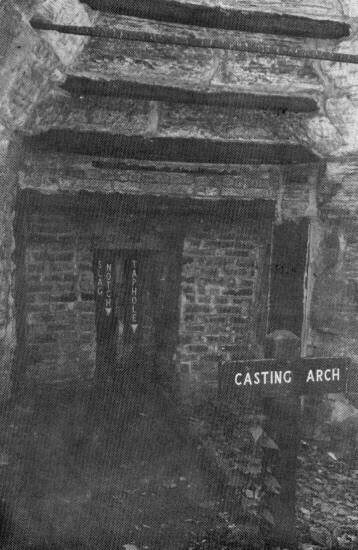 Molten iron and the slag were drawn off in the casting arch. The furnace was constructed with two holes left in the top, one over which the chimney was built and the other the trunnel head for the charges. The trunnel head was covered by an iron door which was opened when the charges 'were dumped in. At the bottom of the furnace there were three openings. One was the casting arch where the molten iron and slag were drawn off and the other two were the tuyeres where the cold blast of air was forced into the furnace. Hired workers and slaves built a rock and earth dam to raise the water level in the spring pool to provide water for the tail races. The water powered the large undershot water wheels of the sawmill and gristmill as well as the tub blowers and trip hammers which were yet to come. The ore for the furnace was mined about one-fourth of a mile from the furnace by pick and shovel with slaves doing the greatest amount of the work. They loaded it in wagons and hauled it to the bridge house where workers sorted it so there was a high grade and low grade ore mix. If they ran all high grade, they would lose a bigger proportion of the actual iron Content, so they mixed it with low grade ore. 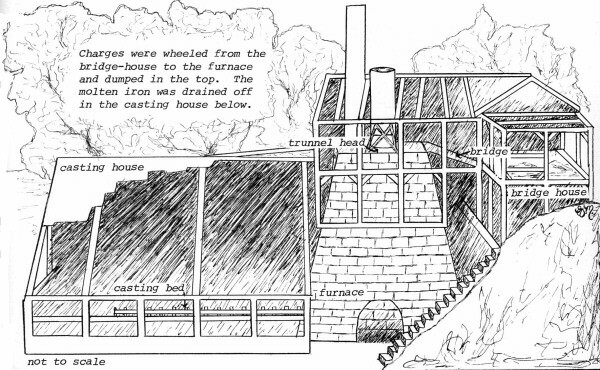 The furnace was built close to a perpendicular cliff to facilitate charging the furnace. The bridge house on the cliff had a bridge that led out to the furnace top and trunnel head. At first charges were wheeled from the bridge house in little hand carts to the furnace where the contents were dumped in through the trunnel head. In later years a rail dump bucket was added so the furnace could be charged faster. The bucket was attached to an overhead rail on which the bucket was pulled. The bottom of the bucket was hinged so by tripping the lever on the side of the bucket the bottom opened and dropped in charges for the furnace. The furnace was operated twenty-four hours a day seven days a week by men on twelve hour shifts. They charged the furnace nearly 100 times per day, with each charging consisting of 640 pounds of iron ore, 18 bushels of charcoal, one bushel of brands (half charred wood) and 100 pounds of limestone flux all dumped in, in' alternating layers. Colliers charred the wood for the fire in the area where it was cut. Colliers had to be very experienced to reduce wood to charcoal for the works. In 1829 these men converted 4,000 cords of wood into a little less than 100,000 bushels of charcoal. As iron production increased so did the need for charcoal. At its height of production in 1867 the works needed 650,000 bushels of charcoal per year, requiring the charring of nearly 16,000 cords of wood. To produce this wood many acres of trees were cut each year. At first only the best charring trees were cut but as the demand rose, nearly all the 10,000 acres of land that the works owned was clear cut. Nearly 100 men were needed to cut this amount of wood and local farmers during the winter months would cut wood to supplement the money they made farming. The owners used slaves to cut wood with a daily quota of one and a half cords each. This was very hard work causing many slaves to run away back to their owners because Samuel Massey worked them too hard. A blast of air coming in the bottom of the furnace through the tuyere increased the heat of the charcoal enough to melt the iron. The air blast came from the furnace blower house where two cast iron cylinders four feet in diameter with a stroke of four and a half feet pumped at sixteen strokes per minute. The cylinders were powered by a sixteen foot water wheel which drove an octagonal axle twenty-five feet long and three feet, three inches across the facings. The air traveled 300 feet through an eighteen inch pipe and arrived at the furnace at four pounds pressure. When the iron melted it dripped into the hearth where it was drawn off four times per day in the casting bed. 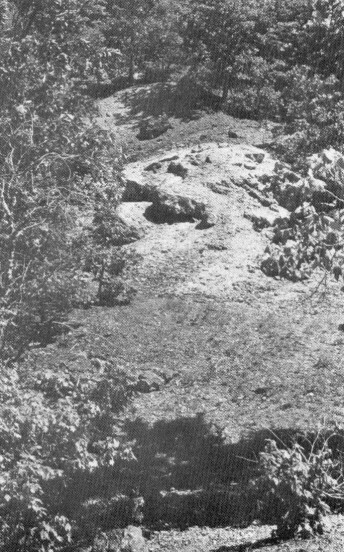 The action of the limestone caused the major part of the impurities to form a glassy substance called slag which floated on the iron and was drawn off through the cinder notch and discarded wherever a hole in the ground needed to be filled. In later years the slag was just discarded around the bridge house. Today part of the hill around the furnace is slag. The iron that was run into the casting bed was called pig iron because the shape of the casting bed reminded the workers of an old sow with her little ones. From the casting house it was taken over to the refinery forges in the bloomery. In the bloomery the pig iron was reheated and covered with charcoal until it was melted into a pasty mass called a loup. From there it was put in a cart and taken to the trip hammer where it was subjected to blows by a 10,981 pound hammer. This pounded it into a rough ingot about twelve feet long by pounding out more of the impurities. Then the iron was reheated in the anchony forge and pounded down again. After the anchony forge, it was reheated once again and beaten to the finished product, wrought iron bars. Skilled finers and furnace workers were constantly needed from the east. Enduring the long hot hours in the casting and bloomery buildings, they built up the reputation of how good Maramec iron was. In 1841 with the Maramec works making a good profit, Samuel Massey convinced Thomas James to add a rolling and slitting mill. The iron would be reheated to a high temperature and rolled into flat bars or small rods for nail production. Coal needed for this operation was readily available in the area, but Massey did not check the coal's sulphur content which proved to be too high. Eastern coal was too expensive to ship, so this mill proved to be an expensive failure. In the early months of 1847 William James convinced his father, Thomas James, to buy out Massey's one-third share of the business. William would take over and pay his father $5,000 a year rent. Massey sold his share to Thomas James for $20,000 and moved to a farm in Franklin County where he farmed until his death. William and his brothers were inexperienced in the running of an iron works, but they managed to keep it operating. William later bought out his brothers and was totally in charge. Transporting the finished iron to markets was always a major problem. Before the railroad reached St. James in 1860, the iron had to be taken by wagon to a river miles away. The finished product was hauled to Paydown twenty-one miles away on the Gasconade River where it was floated on keel boats to the Missouri River and down to the Mississippi to St. Louis where it was distributed. During the dry months only small amounts could be shipped because of the boats running aground in low water. Some was hauled by wagon directly to other towns in Missouri like Lebanon, Rolla and Springfield where it was sold on a commission basis. The store at the iron works also sold iron to anyone who came by that needed it. Gold miners heading for California during the gold rush as well as families heading West made the works a stopping point to pick up supplies and have new wagon rims put on at the blacksmith shop. Farmers from the area came to buy nails, ax heads and plows they needed in their farming operations. Many of these iron products were made in sand castings as the iron came out of the furnace. The bloomery was where the quality for Maramec iron got its name. The men endured long hours to build up the name for the iron. The first cabins were built for the workers in the fall of 1826. They were one room cabins with a fireplace on one wall and a sleeping loft on the opposite wall, having dirt floors and no insulation. The winters were very cold. These cabins that were built along the road that led to the mine became known as String Town. The cabins for the married men and Massey were a little more elaborate with two rooms and wood floors. Thomas James never lived at the works, though he visited sometimes to see Massey who kept him informed about the problems and operations by mail. These cabins were built in a separate section closer to where the works were to be erected. In later years the finers, who were the men who worked in the bloomery, built cabins across the stream because they were highly skilled and better paid than the average worker. Others who worked there or were just passing through could stay at the boarding house. The store and gristmill brought all the needed supplies into the community. They not only sold Maramec iron, but they ground corn and wheat for farmers who moved into the area with the works. Most of the workers and families in this company town of 500 came from eastern states because there were no skilled laborers in the area to run the furnace and refineries. The laborers had little time to spare since they worked twelve hour shifts seven days a week. If they had some extra time they could go to the lodge hall where the other men came to hold their meetings. On Sundays they could go to church with their families or maybe a picnic on the hillside if they didn't have to work. When the works was shut down for repair was about the only time workers had to be with their families. The people of the town suffered with the company owners during hard times. When the price of iron was down there was less work and less money to pay the workers. The smallpox epidemic that hit the town in late 1840's claimed many lives, especially the children of the town who were buried in the cemetery. In 1863 with the Civil War raging and the supply of surplus iron used up, new supplies were needed quickly. The Maramec Iron Works went into full production to supply iron for cannon balls and James Eads' gunboats that were manufactured in St. Louis for the Union Army. William James had made an arrangement that his workers would be exempted from the draft if they produced iron for the North, but in 1864 all his men were ordered into Union camps. However, with a little bargaining and the help of Eads all the men were exempted as long as they produced iron. 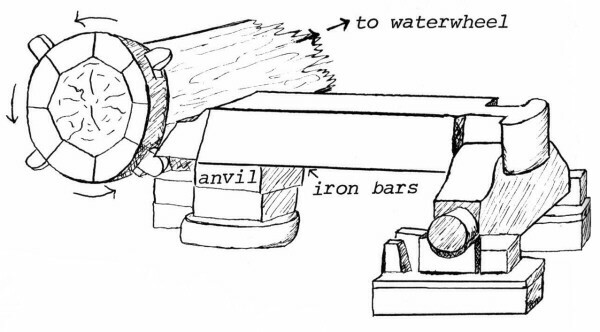 The large hammer, driven by a water wheel was used to pound impurities out of the iron. Below--This is the cemetery where many of the workers and their families were laid to rest. Our thanks to Janis Young of the Maramec Museum without whose help this story would have been impossible. The Civil War proved to be very profitable for the Maramec Works and the railroad that had just been finished to St. James helped to reduce the shipping bills even though the iron had to be hauled seven miles to St. James. This inspired James to build on to his own works, but a friend, R. G, Dun, who had invested in the works advised him to build another furnace elsewhere since the Maramec ore bank was being depleted and wood supplies were dwindling. Ironically, a core sample taken years after the works closed revealed that there was roughly twenty feet more high percentage ore left in the pit. This was enough to last probably ten more years at the rate of use in 1870. 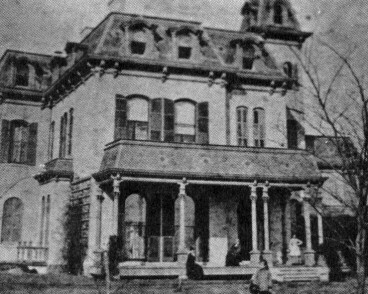 William James started a new furnace at Newburg in 1872 hoping to build it for $97,000, but in the end it cost nearly $245,000. This put James deeply in debt and a depression soon knocked the price of iron way down. The new furnace was built at a very bad time and James soon felt the pinch. He was broke and even though he managed to borrow enough money to get the equipment to convert the Maramec furnace to a hot blast instead of cold, it was never done. The hot blast would have given a much hotter fire than the cold and increased production. To keep his workers until he could pay some of his debts, William paid them with Maramec script which they could use at the company store. The assessment of a $10,000 fine by the state of Missouri for using this money and the destruction of most of the new furnace house at Newburg by fire caused James to go bankrupt in 1876. William, in a bad mental state over the loss of the works went to live with his daughter, Lucy. Since R. G. Dun did not lose much in the bankruptcy of the works, he sent Lucy $2,000 a year to support William until his death in 1912. When Dun died he left three-fifths of his estate to Lucy. Maramec was deserted but signs of its existence would be there for a long time. The furnace changed hands a couple of times but was closed forever in 1891. The town of St. James, which had been a busy place, turned into a sleepy little country town. Dunmoor was the name given to the mansion built by William James during the prosperous years of the works. The population of Missouri was 140,000 people in 1830 but within ten years it was 383,702, an increase of 170%. Maramec was not the only industry which helped contribute to this development, but it was one of the first. The area around the furnace was barren except for a few scrub trees that had been spared the ax. When the cabins and works itself fell in, the place became a very desolate area. In 1938 Lucy James, grandaughter of Thomas James, died and left in her will money to clean up the area and open it up to the public. Today this is a private park for the public. The furnace stack is still there along with the refinery forges and hammers. 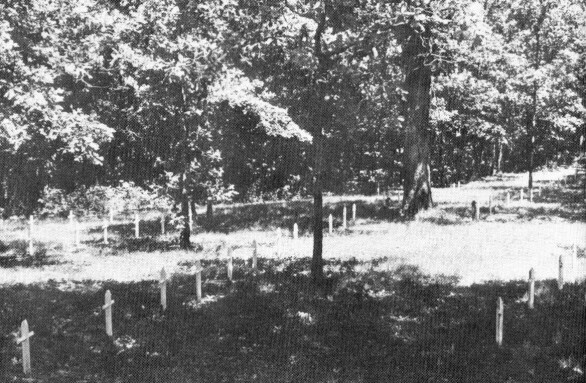 The cemetery where workers and their children were buried has been restored with white crosses marking the place of the buried. A few old tombstones still stand with barely legible names of the workers. The mine, now grown over with brush, is still there with only memories of the many men who took iron from it. The once barren land around the works has a new growth of trees. Though the water wheels and buildings are long gone the atmosphere of the area with its wilderness beauty still exists as it was first seen by Thomas James and Samuel Massey, guided by Indians more than 150 years ago.